Author and photographer, John Roskelley, is a dabbler in everything outdoors. If he’s not dodging rocks on some alpine face in Canada or scratching his way up a frozen WI5 waterfall, John can be found paddling the Columbia River from source to mouth. John admits adventuring flows in his blood. 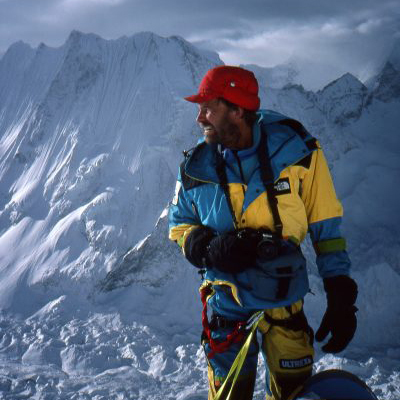 In his first half century, John fought his way up four 8,000-meter peaks, including K2 and Everest, plus a plethora of devilishly hard, unclimbed shorter Himalayan and Karakorum faces and ridges. A graduate of WSU in geology, John has written four adventure books and in 2014 a paddler’s guidebook to the entire 1200 miles of the Columbia River. His photography has been on the cover of National Geographic, multiple book covers, posters, and other notable national magazines. John received the International Piolets d’Or Walter Bonatti Lifetime Achievement award in 2014 and was recently made an honorary member of the AAC. John and his wife, Joyce, have been married 46 years and have three great kids.